Consider what personal elements are important to you e.g.looks, personality, interests. Search sperm donors Now! 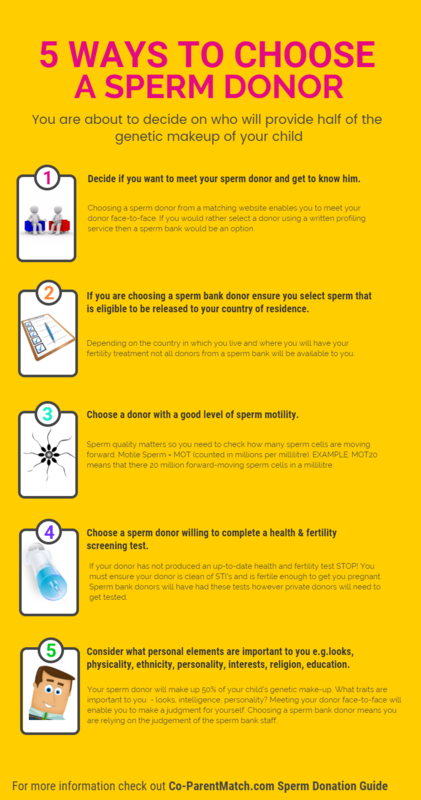 How do you choose the right sperm donor? Finding yourself in a situation where you are trying to get pregnant using a sperm donor and deciding how to go about conceiving a child may not be something you had planned. Choosing a sperm donor, regardless of the reason, has become more socially and medically acceptable, but again, the question is still how do you choose the right sperm donor? How do I Choose a Sperm Bank? What is the basis of their application process for donors? Do they have any outstanding legal issue unresolved? Limit of matches per donor/recipient? Are you comfortable with the staff and environment? What is the CMV Status of my sperm donor? When choosing the sperm bank this is not something you are going to want to do overnight, or in your first visit, look and see what your options are, and interview more than one location,discuss this with your partner, and take the time to make a sound decision before choosing the bank that will hold your sperm donation. When using a sperm bank meeting your donor face to face is not possible. Some sperm banks will show sperm donors with pictures. Donors will provide baby photos and some will also have pictures of sperm donors during their teenaged or adult years. This will give you an idea of what genes your baby will inherit. You can meet a sperm donor face to face by using co-parentmatch.com .This will give you the opportunity to ask questions, observe habits, physicaland mental stats, and overall, gives you the chance to see into the future. See the potential traits you would be giving your unborn child. Congenital CMV is an infection which can develop when a woman is pregnant and infects the unborn baby so it is important to look at your sperm donor’s medical information and if the sperm bank you are using declares if their donors carry the CMV virus. What is an open ID donor? Open ID donors are also known as ID release donors. In the USA and some European countries these are donors who have agreed to be contacted by their adult offspring when the child reaches 18 years of age. Are there Sperm Donors for Single Women? Sperm donation for single women is a growing trend. Many women who are not in a relationship are taking matters into their own hands in terms of planning a pregnancy by a sperm donor. Single women do not necessarily want to risk waiting around only to find they cannot find the right partner in life to start a family. There are lots of options for single women including sperm banks where you can purchase sperm from a donor list. Introductory sites like Co-ParentMatch.com enable you to meet your sperm donor face to face and arrange for home insemination or artificial insemination at a clinic. Are there Sperm Donors for Lesbians? Sperm donors are in high demand for lesbians looking to start a family. Particularly with gay marriage on the rise lesbian couples who have settled down in a long term relationship are increasingly looking to get pregnant by sperm donation. Many single lesbians are also looking for sperm donors to help them have a baby. Some women are happy for their donor to be known to the child and have a relationship whereas others are searching for an anonymous donor who will not be involved in the child’s life. Co-ParentMatch.com is a leading website in matching lesbians with sperm donors. You can search for donors by location, looks, personality, age, ethnicity, religion and many other factors. Are there any Free Sperm Donors? Free sperm donors will provide you with sperm donation to help you become pregnant. Many women cannot afford to go through a sperm bank and are therefore looking to become pregnant via a private arrangement with a donor who will not charge. There are lots of men who are willing to donate for no money and simply wishing to help women start the family they so desperately want. Choosing a sperm donor is an exciting step. If you are looking for a free sperm donor you can find a great selection by using our online search tool. We have thousands of donors all around the world who are online right now willing to help you become pregnant.